Unshakeable Salt is an information security consultancy, providing InfoSec and AppSec contractors across the United Kingdom. USB, does it stand for Universal Security Breach? Copyright © Unshakeable Salt. 2019 • All rights reserved. To an outsider it may seem strange that a security company such as Unshakeable Salt has such an unusual marketing budget and strategy. With engagements coming primarily through direct agency contacts or via word-of-mouth, why bother paying for visual advertising at all? Over the last few years we have focussed our marketing and have been paying for visual advertising ‘in and around’ sport. Not because the sport sector is particularly vulnerable to information security flaws, but because of the focus it provides. 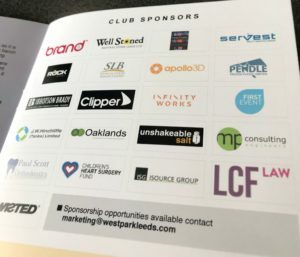 We have purposefully been sponsoring sports teams where we know that the connections are close with directors of IT companies. When we are mentioned by one our existing customers, it’s helped make a personal connection. Think of this as the ‘Oh, I’ve heard of them but can’t quite think where….’ factor. This has usually been because one of their own children has been wearing our name across their football/rugby shirt for the previous two seasons! Now I write this in April 2018 and with the above all working well. Without resting on our laurels, we are now going to upscale this approach. Continuing to sponsor the teams we already sponsor, we’re now going for a national reach. To do this we would love to say that we’re sponsoring a national team, but that would be a tad excessive. Instead we have now sponsored a couple of players in a top flight national league. The money we spend on sponsorship isn’t particularly a lot. In fact, compared to most small companies it is minuscule. Compared to other security consultancies though, we do spend a lot! The accountant does ask the question of can I prove the Return on Investment and I can honestly say I can. It is measured in a different way than normal, a way that is better than hard cash coming through the door. Our marketing might not bring contracts to the door directly but improves our name and gets our company known. It enriches our reach and unlike Social Media where we only get one hit for every 5,000 views, we get a couple of hits for every 100 views. We get more consultancy roles from this form of marketing, unlike the contracting roles we get via traditional channels. We also get to be involved within our community. As Information Security Professionals, our employees must obtain numerous continuing Professional Education (CPE) points every year. As a rough rule of thumb, we get 1 CPE for every hour of education. But taking a whole day off work for an 8-hour course is extremely expensive. Not only for the cost of a course, but also for the loss of revenue for a day. Now we’ve found a solution that is cost effective and benefits our workplace; providing security education for free. By reaching into our local community, we can provide the (ISC)² Safe and Secure online presentations out of office hours. People around us become more security savvy and our staff get CPE’s without having to take any time off work. If each marketing sponsorship generates a couple of presentations, then the marketing has paid for itself. This is why we are paying for visual advertising. The players benefit from the sponsorship, our company benefits from re-certified staff and our clients benefit from having security savvy staff. Everyone wins. If you would like to arrange for your club, association or even just a group of friends to hold an Safe And Secure online evening, please do feel free to drop us an email to SafeAndSecure@unshakeablesalt.com We don’t charge and tailor the content to suit parents, junior and seniors as required. 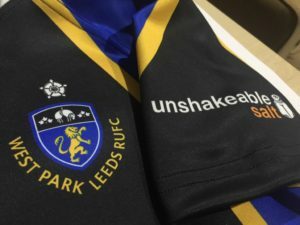 Joining our previous club sponsorships of West Park Leeds RUFC and Catalan Soccer, can we say a big ‘hello’ and welcome Leeds Rhinos Ladies RLFC in their inaugural year. Especially to Natasha Gaines and Leah Birkin in agreeing to let Unshakeable Salt sponsor you and we’re looking forward to following both club and players progression throughout 2018. Director of Unshakeable Salt, an Information security specialist who first started contracting in 1997.